In an attempt to make my life a little easier, I'm planning all of our dinners for April at once. So, here we are again. At the end of another month. And while I wish I could tell you that it was a productive time for the blog... it wasn't. I only published two new posts in March even though I had planned to write so much more. A year ago, the failure to stick to my content creation schedule would have disappointed me. But I'm learning that I can't concurrently put 150% into every area of my life, at least not for any considerable length of time. The recent relative silence on Taste As You Go just meant I was focusing my energy on other important things in my life. Like celebrating Caroline's first birthday, signing new freelance clients, and spending time with friends. I'm getting closer to achieving a balance that makes me happy, so slowing down the blog has been worth it. When I decide it's time to pick things up again, I'll be ready. I have a list of posts that I can't wait to share with you! 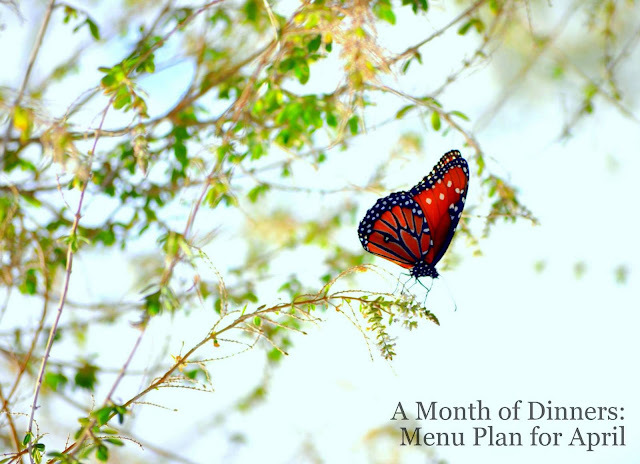 Thinking of starting a menu planning routine? Check out my previous menu plans, as well as these helpful meal planning tips. Do you plan your meals? What's on your Menu Plan for this week/month? I'm always looking for dinner inspiration, so let me know in the comments! Six years ago: Remember That Trip to Knoxville?